As its now confirmed that Apple is going to launch iPad 2 on April 29 in India and most of the Apple Fan boys in India are excited about this news. Those who can afford it are going to have their hand on Apple iPad 2 as soon as possible. Today we will try to compare side by side Apple IpadÂ with Samsung Galaxy Tab which is quite popular in India as it was a great alternative to Apple iPad as Apple released iPad 1 in India almost 9 months late than US. I have tried to highlight the major differences between the two in terms of specifications only. Some of the majo differences include screen size, availability of card slot to add expandable memory,Â Camera , battery talk time and Processor. 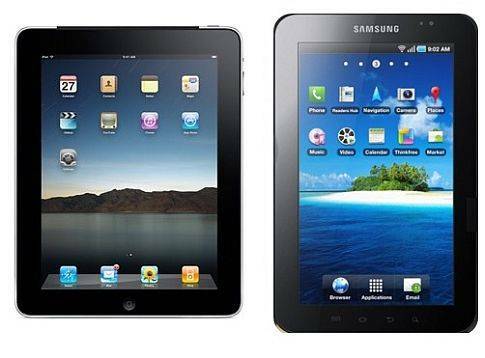 Galaxy tab is based on Android 2.2 while iPad 2 is on iOS 4. Availability ofÂ a vast App store is a major advantage for Apple iPad 2 compared to Galaxy tab. I would love to hear some feedback from some real users as I am still far away from having one of these on my own. PS:- I have not used both these tablets i.e Galaxy tab or iPad 2. I have just compared the specifications side by side. Galaxy Tab has Android, I-Pad has not, the table is wrong. May be there are more mistakes. Thanx for pointing out. Looks like I have misplaced the two titles of iPad 2 & Samsung galaxy tab and they got interchanged. I just corrected that. The original 7″ Galaxy Tab doesn’t stand anywhere in front of iPad 2 which is truly a magical device. You should have compared it with the new Galaxy Tab 8.9 or Tab 10.1. La camara del ipad2 es horrible, saquei una con los dos equipos, el samsung la cualidad es rebuena, mientras el ipad es igual una VGA. La tv digital e analogica tambien es una gran diferencia, sirve tambien como telefono, el precio del samsung es bien mejor e la cualidad tambien, ipad es apenas um mombre. I agree with you. Iâ€™m please can you help me as I can find the imformation I need. Thank you very much!